Around June or July, my husband was playfully massaging and tickling the boy and was surprised to feel a curve along his spine. We never noticed it before and when I checked, there was indeed a curve to the right. We suspected it to be scoliosis. He never had any complaints with his back or spine so I overlooked it for months. 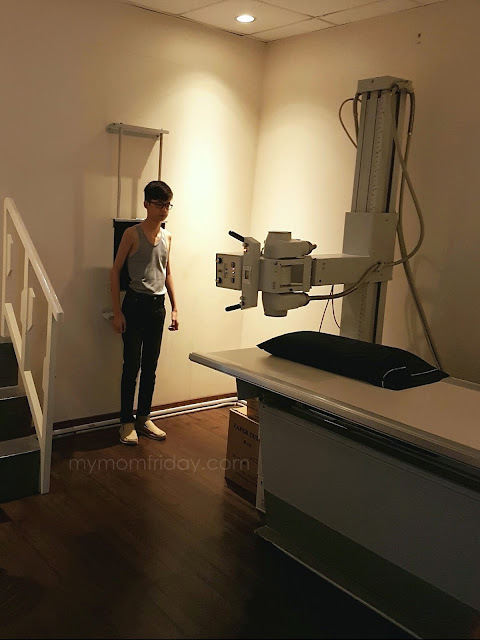 When I had my 3D mammogram and bone densitomerty last October, I remembered his spine and inquired about a scoliosis checkup. 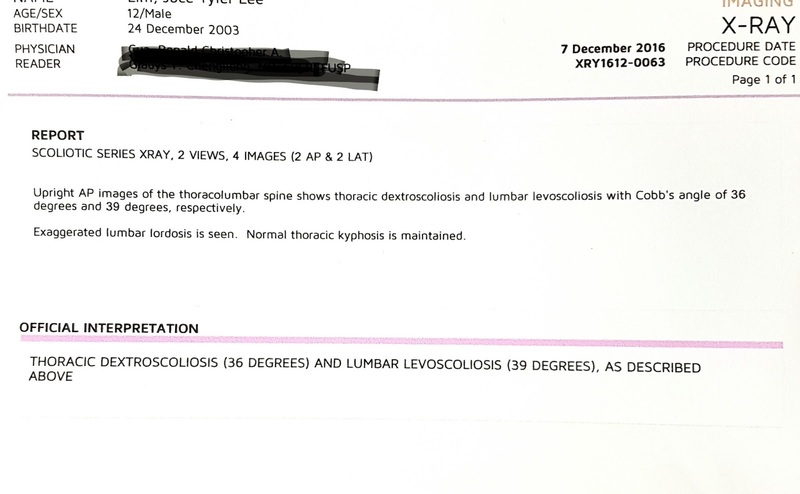 Eventually, we consulted a doctor and he was diagnosed with scoliosis. He recommended an x-ray immediately. According to Wikipedia: Scoliosis is a medical condition in which a person's spine has a sideways curve -- usually "S" or "C" shaped. In some, the degree of curve is stable, while in others it increases over time. Mild scoliosis does not typically cause problems, while severe cases can interfere with breathing. Pain is typically not present.Treatment depends on the degree of curve, location, and cause. Minor curves may simply be watched periodically. Treatments may include bracing or surgery. The brace must be fitted to the person and used daily until growing stops. Exercise is still recommended due to its other benefits. The doctor said the cause is unknown, but it may also be hereditary. We don't have anyone in our immediately family that has scoliosis...well, none that we know of. Puberty and growth spurt also made the curve visible. It is more common among girls than boys, and occurs between ages 10 to 20. The doctor presented different scenarios, based on the Cobb angle after the x-ray. They include bracing and/or therapy as treatments, on top of continued exercise, like swimming, to strengthen his back. I was hoping and praying for the best. This week, the boy had his x-ray and then we went back to the doctor today for the findings. I was afraid that the degree of the curve will require him to wear a brace. If degree is below 20, physical therapy and exercise, plus regular check up are recommended. If degree is above 40, surgery is needed. Based on the Cobb angle from the boy's x-ray, he would need a brace, huhuhuhu. It was scary to see the curve because the reading is very close to 40 already. (See results below). The goal of wearing a brace is to prevent the curve from getting worse. The spine will not straighten anymore, but with the proper and regular treatment, it may improve slightly at best. At his age (he just turned 13) his bones are still growing and flexible so the doctor is optimistic. Next step: Seek a second opinion before we decide on the brace. For now, he will continue with swimming as his regular exercise. He got scared after hearing the "surgery" but the doctor said he won't need it if he wears a brace and be diligent with therapy and exercise. This unexpected health condition is another challenge that I hope he can adjust to once we start with his treatments. Scoliosis is not uncommon among teens. 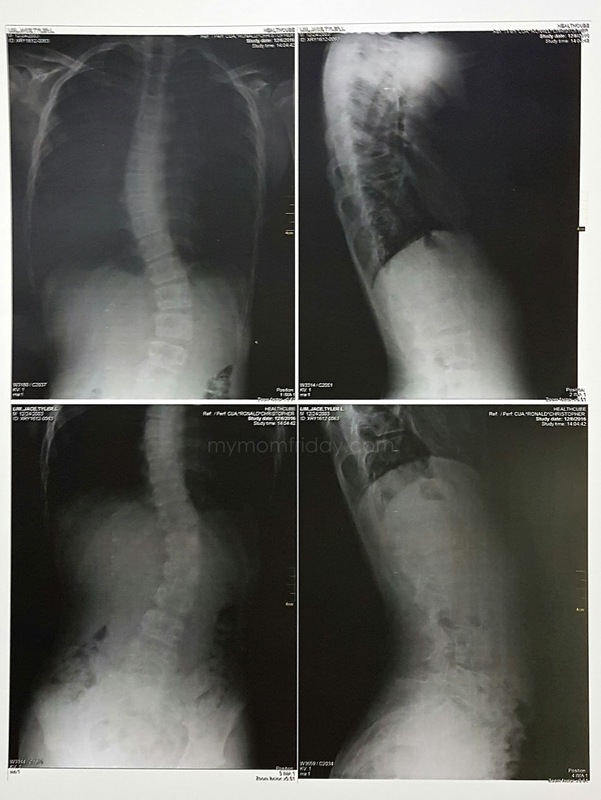 According to Kidshealth.org, people with scoliosis can have active, normal lives. Doctors don't know of any activities (including things like sports or carrying a backpack) that make scoliosis worse. So, people who have scoliosis should still be able to play their favorite sports and carry on as normal after they recover from surgery.